Let me introduce you to my newest patterns. 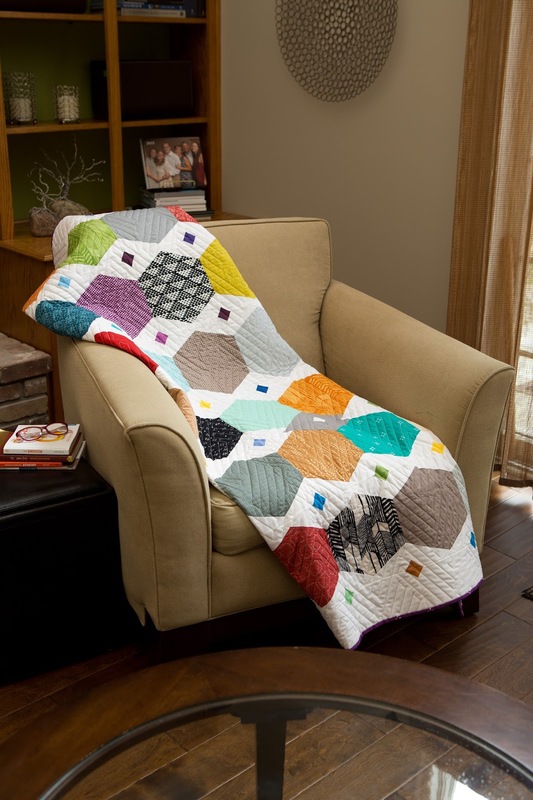 First, Bejeweled, which was just published in the Modern Quilts Unlimited magazine, issue 19, as a Web Extra. You can download the free pattern from their site by clicking here. It measures 54-1/2" x 65-3/4", and it was quilted by Sew Shabby Quilting. Only when I added the gray on that particular spot did I notice what a fun twist the corner triangles where adding to the pattern. Bejeweled was made with Hexagons from the Simple and Honest collection by Me + You by Hoffman Fabrics. 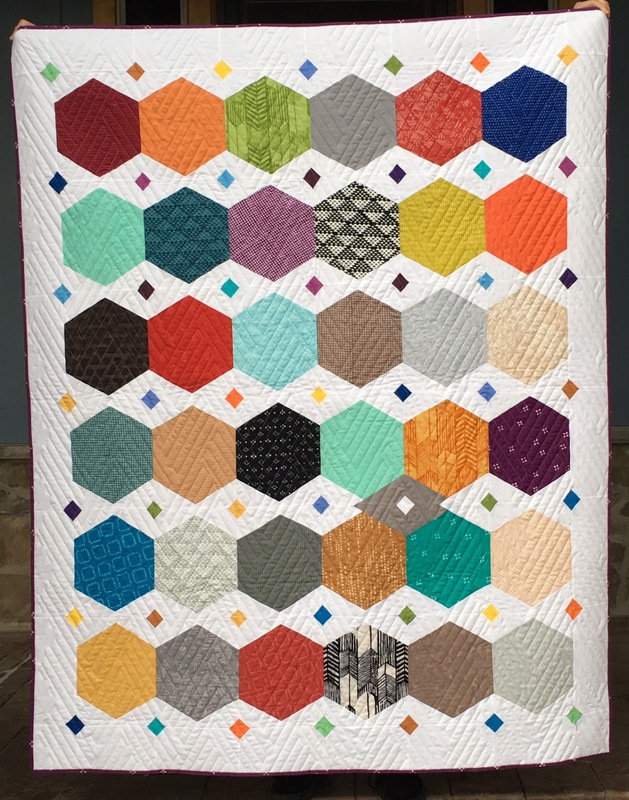 I had that stack of hexagons for a while, waiting for an idea which would feature them in all their glory - I refused to cut them! One night I woke up around 3 am with this pattern on my mind, and the rest is history. I do provide a hexagon template with the instructions in case you want to use yardage of other fabrics. 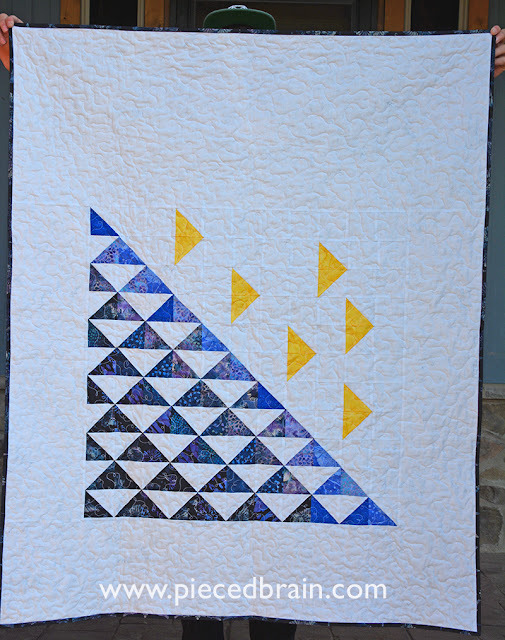 Photograph by Kevin May for Modern Quilts Unlimited. Used with permission. Second, appearing in the magazine and not online: my wall hanging called "Dare! ", although its name was changed by the editors of the magazine to "Setting Sail". The blue triangles are 'flying' in formation, and the yellow ones are daring to be different and to fly in a different direction. Thus the inspiration for the quilt's name. The batiks are by Hoffman Fabrics, too. Aren't they beautiful? I quilted it with loops in my Bernina. Photograph by Laurie Baker for Modern Quilts Unlimited. Used with permission. Notice the iguana to the left of the quilt! I can't wait to get these quilts back so I can display them in my house. 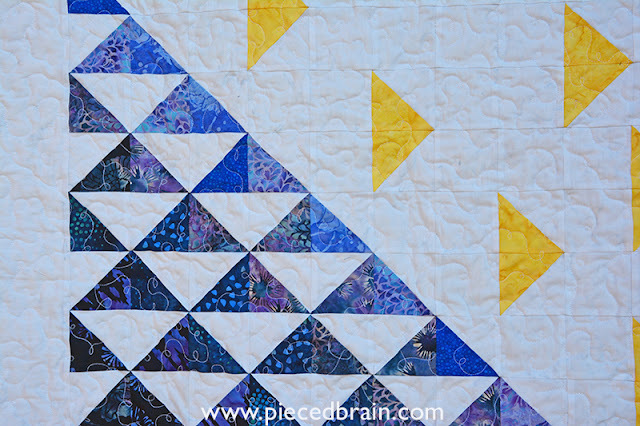 I hope these projects inspire you as you sew today. Those are both wonderful. Great designs. I love your quilts and your photoes.